Have you ever had that before? Have you ever started a major online project, sat down to have a research session, then drifted off to see how Southampton were getting on (that's definitely only me), or watched that monkey do high kicks for what seems to be the millionth time. I'm sure that you're all still with me on this one, although I do see a couple of you sat at the back playing with your Blackberries.... Now what was I saying again? The point that I'm trying to make is that although we have an almost constant stream of information available to us at the click of a button, I fear that we may have to cope with the effects of this 'want now' society in years to come. Personally, I think that constant interaction and networking is one of the big boons of digital media (and social media in general - of course it is, it's the crux of the whole medium), but what I am worried about is whether or not in the near future we will have the patience to read an extended article or novel, or have the patience for a film that doesn't smash our senses into a million pieces with the use of 3D specs. In his book 'Is Google Making Us Stupid? ', Nicholas G. Carr is incredibly critical of the internet's effect on cognition. It divided opinion, but as with most of these topics, whilst I can see fault in Carr's 'Deep Reading' argument (you don't have to be able to read Shakespeare, or even spell it to contribute to society), I am curious to see where our soundbite and character-light online experience takes us, and whether books and long-winded thesis' will be a thing of the past as we progress deeper and deeper into our online worlds. In short, will 140 characters soon qualify as Too Much Information? 'Little Jinder is a 20-year-old Stockholm sweetheart who mentions her discovery of synthesizers around the same time of her discovery of boys. Jinder lived in the UK and received a diploma in sound technology at Paul McCartneys Music University "LIPA" (The Liverpool Institute for Performing Arts). Jinder recalls her influences come from New Order and Kate Bush, but we feel they are far deeper than that. Social Media, Enagement, or just talking to your customers? A lot has been written about the role that social media has to play in the future of the music industry. Needless to say, it is pivotal, and joins the list of other innovations (singles, music videos, home recording software, the internet) that have the potential to shape the music industry for the better. But despite the benefits of this relatively new medium, many labels, both major and indie, have yet to grasp the importance of it. I'm going to have a brief stab at explaining it - a very basic overview, and a few of my own points thrown into the mixer. What does it mean for labels? To put it simply, you cannot simply sign an artist, assign a budget, shove out a few e-flyers and set up a Myspace page (ran by somebody at the record label for five minutes a week - trust me, I've seen this in action). You need to work with the artist, highlight their strengths and weaknesses in communicating their message (writing songs aside - leave that to A&R), and enable them to work with you to achieve a social networking presence that is both credible and welcoming. Set up a site - or rather a hub for your artist. Make this the epicentre of your online operation, not the final solution. Single-platform web portals are no longer enough - to achieve a 360 degree mix you have to be on the ball constantly, and have the core four social media outlets nailed (Myspace/Facebook/Twitter/Blog), with a strong presence on all. But this needn't be a hard slog on your part - in the post-industrial landscape we find ourselves in, artists want, and need to have more of a say, and more of a web presence to gain the respect and appreciation of their audience. So essentially what I am saying is that if you sign a band, make sure they are open to promoting themselves bar the odd interview, gigging and video shoots. It goes so far beyond that these days. What does it mean for artists? As an artist, you can no longer hide behind a major label marketing machine. If you do not have much to say, then you will get lost in the din. You, your songs and your thoughts are the biggest assets that you have, so use them wisely, and don't be scared of ruffling a few feathers. Respond to criticism constructively, offer your fans throughts, insights and free downloads they may enjoy. Socialising and engaging with your fans is a 24/7 job, but it needn't be a chore - these people love what you do, so talk to them, share with them! So in short, I've only just scratched the surface of this massive subject. I think it's because I'm very tired, and have been reading about social media for so long I start to suffer from tiredness-enduced TMI syndrome. In the meantime, check out this video from one of my favourite bands at the moment, College. How behind the times am I? This beauty is over a year old, and from the frequently misfiring combo of Herve and Kissy Sellout, but crikey, this is a banger. A dutty banger, you might say. Or not, even. HERVE & KISSY SELL OUT + BEENIE MAN (Mashup) by B.A.R.T.O. The So So Glos - "My Block" from Matt Greeley on Vimeo. I've always had a soft spot for Richard X. It matches my massive damp patch for arch 60's inspired pop purists/archivists Saint Etienne nicely, so when I heard that the two were working together then I decided that you needed to know the full skinny. So I decided to track down the elusive pop genius and get him to give us the full run down on his re-imagining of the nineties classic, 'Foxbase Alpha'. Hi Richard, how are you today? What have you been up to? I'm good thank you. I've just been looking at a couple of the tracks I'm doing soon with a band called "The Hundred In The Hands" who've just signed to Warp. You've remixed one of the classic albums of the 90s, Saint Etienne's 'Foxbase Alpha' - how did you first get in touch with the band? and from that we got talking. When did you start thinking about remixing the album? 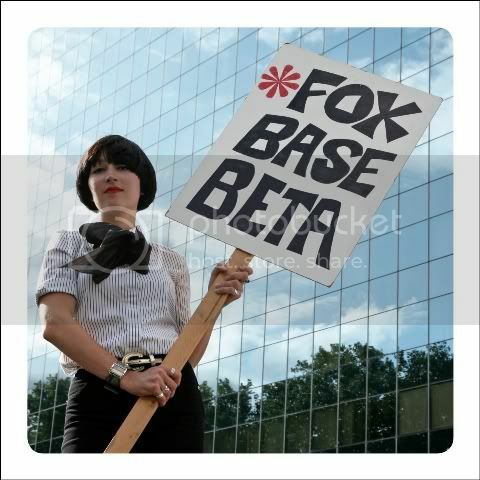 last year that we were chatting about how Foxbase was the kind of album you could do something to remix wise and it'd still be in the spirit of the album and the era it came from. I think the idea of what the Mad Professor might do, like a dub version, but in a pop sense, was a parallel. It kind of turned into this idea of a "re-production" as much as a remix. We wanted to keep what was great about the original and spin new ideas out of what was there. Were you a big Saint Etienne fan when you were younger? Yes, Foxbase Alpha and So Tough sound tracked my move from the north down to London, so when i got down here it felt like I was nearer the world they had painted a picture off. They used to print their address on sleeves so i went and stood outside what i thought was Bob's house as a student. He didn't appear and I'm not sure what I was trying to achieve. I loved their Icerink label, the Golden and Oval records were my favourites. I am officially Oval's number one fan as I wrote a letter and I was the first of 65 letters to hit their doormat. It probably is just my taste, I like female vocals and electronic music. It's kind of self perpetuating because when you've done a few records with female artists that's what you're known for and that's what comes your way. And boys smell, of course. Who have been your favourite artists to work with, and why? should do my Top 20 artists I have worked with weighing up factors like talent, soundness of musical vision, quality of humour etc and you could publish it and I'll never work again. My favourite type of artist to work with has a focus on what they want to do but isn't closed minded about how we achieve that, and who isn't too hung up with writing "The Hit Single" on the session although that's often what we're supposedly there to do. Affair record, but that kind of changed when I heard some of the songs he'd demoed, so we started making a different kind of album. It probably doesn't sound much like anything I've worked on before and it should be out early next year. filesharing hinders young artists, or does it provide another route outside of the traditional gigs/demo/management route to attracting attention? review it. As a creative tool, and for the unsigned artist, well you've never had it so good. It's just for those that might go on to have careers in the industry or as an artist will find it even tougher than it has been. What are your views on the singles chart? Do you think it is still a relevant way of measuring an artist's success? most popular music in the UK at that point in time so surely it has social relevance whether you like what's in the chart or not. Does all of this have a bearing on how your music will be produced and released in the future? should be a good thing. Do you have any plans to release another solo record? What's next? trying to make things just a bit different. The plan at the time was for my second LP to be one group, I think Sweet-X was the appalling working act name! Maybe I'll revisit that idea. That might be spurred on by my greatest frustration at what I do which is just the ridiculous amount of time it takes for things I've worked on to come out. One recent release I've produced took over 5 years to come out, it had been in and out of fashion twice but luckily hit the upward curve of trendiness. And finally, if you could rescue one old record and one new record from a skip, what would they be and why? copies of my precious album. Tears are welling up as i speak so for that reason I am unable to answer. This one is pretty much self-explanatory, yet strangely not quite as inevitable as I thought it would be. Oasis, one of the biggest bands of the past two decades, have called it a day. Noel has had enough it seems, and has (as per usual) posted a short statement on the official site stating his decision and reasons why he felt he had to leave. Funnily enough, it's Liam. So far, there has been no official statement from the Oasis camp, but surely this must be it - Liam is now the only original member left, and even he cannot fill the massive personality (and talent) vacuum left behind by Noel's departure. Sure, Oasis have been responsible for some pretty atrocious gobbledegook in their time, ('Standing On The Shoulders Of Giants' was certainly their creative nadir) but one thing aside from the music really impressed me about the band - they never lost touch with their fans. One of the most important things in music is the sense of community, of belonging, that it can create. The shared euphoria of an amazing live gig is the closest many of us will ever get to a religious experience. But with many of the best bands around, it is not simply a question of writing great song after great song (although that can help); it is allowing their fans to share in the experience. Noel and Liam were (are) loved for being the everyman - funny, succinct and defiantly proud of their background, the Gallaghers never lost touch with the crowds that flocked to see them. Who wanted to be them, but would happily settle for sharing a stadium with them. They held up a looking glass to a generation of working class kids and showed them a panoramic view of what they could achieve if they put their minds to it. They made it. You could too. They soundtracked many of the best moments of my life, and I will miss them. The tories suffered their biggest local election losses the month 'Some Might Say' hit the number one spot. The better day they dreamed of might not have come to fruition, but it meant a hell of a lot to me. They were funny, they were great, and they made me smile. Here's one of my favorite live tracks of theirs, a Neil Young cover. I hope you enjoy it - the lyrics are pretty fitting. So i'm currently working on an article regarding online algorithms for the rather wonderful Flipside Magazine, and all in all it seems to be going quite well, although as with most things in life, more questions seem to crop up the further I get into the article.